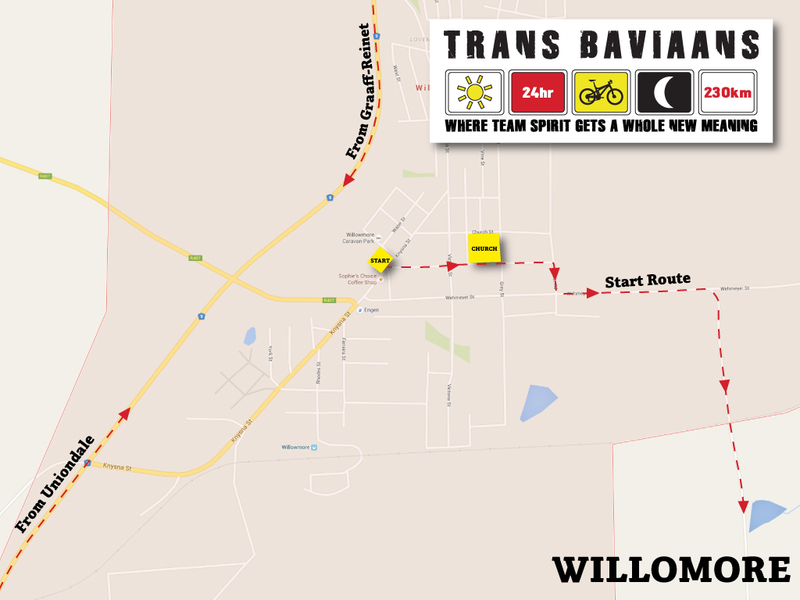 The Trans Baviaans 24hr Mountain Bike Marathon route starts in Willowmore in the main street (± 700 m above sea level) and then follows a farm road through Poortjies to link up with the Baviaanskloof turn-off ± 4 km out of town. The route then ascends over a distance of ± 26 km to the top of the spectacular Nuwekloofpas (± 1000m above sea level). For the next ± 80 km the route drops down into the Baviaanskloof passing through a number of farms such as Rietrivier and the Baviaanskloof Police Station at Studtis, after which it enters the Baviaanskloof wilderness area under the control of Eastern Cape Parks Board. This long descent ends at Geelhoutbos a distance of ± 110 km from Willowmore. From here the route becomes more strenuous, narrower and more difficult to negotiate, reaching a high point at Bergplaas, at ± 147 km from Willowmore. From here it drops suddenly into the Cambria Valley past some citrus farms and the Komdomo Camp site in the banks of the Groot River at ± 175 km mark. From Komdomo the route follows the road to Patensie but before reaching it turns off to Humansdorp on an undulating gravel road to cross the Humansdorp-Patensie tar road at ± 210 km mark. 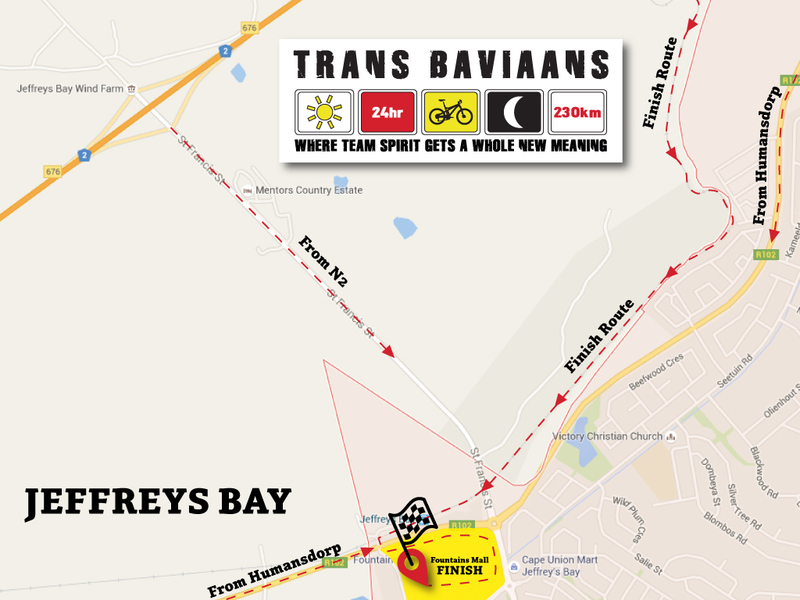 The route then follows a farm road to Jeffreys Bay were it finishes at the Fountains Mall in Jeffreys Bay, 230 km from Willowmore. The total accumulated climbs for this route is 2540m. Please note: Riders must take note that the route will not be marked as orienteering plays an important role during the event.